Already energy efficient? Now you are ready for a renewable solution to cover your energy needs. 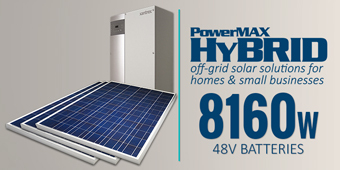 PowerMAX offers affordable and scalable turnkey photovoltaic (PV) solutions for grid-tied and hybrid applications. Our PV (solar) solutions are designed and pre-assembled for various load profiles. Simple, cost-efficient and reliable. Other solar powered products, such as water heater and outdoor lights are also available. PowerMAX HyBRID PV Solar Systems offer turnkey off-grid photovoltaic (PV) solutions suitable for homes and businesses. 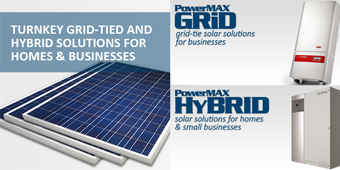 PowerMAX GRiD PV Solar Systems offer turnkey grid-tie photovoltaic (PV) solutions suitable for businesses.